We’re delighted to be working with Curse of Lono! 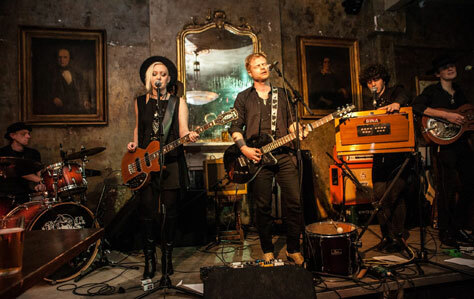 Acclaimed new London five-piece Curse Of Lono released their debut album Severed in spring 2017. A sumptuously cinematic record that combines harmony-laden Americana with driving, gothic alt-rock, Severed was produced at Gun Factory studio by Oli Bayston (Boxed In). The album follows Curse Of Lono’s critically acclaimed self-titled debut EP, released the previous October, which also formed the soundtrack to Saturday Night, a short film of inter-connected music videos directed by Alex Walker. The film recently won Best Music Video at the LA Independent Film Awards, the London Independent Film Awards and Feel The Reel International Film Festival in Glasgow, and has made the official selection at the International Music Video Underground in LA and the Sunlight International Film Festival in Moscow. Founded and fronted by Felix Bechtolsheimer, formerly the singer-guitarist in British roots pioneers Hey Negrita, Curse Of Lono formed in early 2015, though the songs on Severed were written over a 14-year period. They range from the perky, Paul Simon-ish single Pick Up The Pieces to the more lugubrious He Takes My Place, the almost jazzy London Rain and the rootsy, rhythmic Send For The Whisky. The album belongs as much to the Americana tradition and old faithfuls such as The Doors and Little Feat as it does to more modern, playful practitioners of the form such as Wilco and Beck. Main support comes from Manchester-based Izzie Walsh, described by UK Country Radio as ‘gothic bluegrass with a hard edge, her voice is amazing, strong and sensuous, compelling everyone to listen to her’. She will be joined by her band for the show. Opening the show is Kerri Watt. Scottish-born singer-songwriter Kerri Watt spent her formative years living between California and Glasgow, giving her a unique upbringing that has influenced her sound. She taught herself guitar while backstage touring the UK as an actor, swapping a life of theatres for venues. Kerri has spent the last two years touring across the UK and Europe with Starsailor, Ward Thomas, Embrace, Nina Nesbitt, The Overtones and Mike & The Mechanics to name a few.